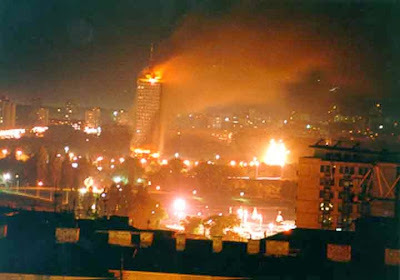 While it should be obvious why the "Yellow October" of 2000 matters to the Serbs and Serbia, the oft-unanswered question is, why should it matter to anyone else? "Wherever they go, these agents of chaos infect the target country’s politics, manipulating genuine local activists into becoming the agents of their people’s demise. While they preach democracy, their dirty tricks are effectively destroying its credibility in the long term. That’s fine with them, however; the objective is not democracy but obedience. Besides, they won’t stick around to see the consequences - there is always the next revolution to plan and execute." It's not just that having done it once, the Empire proceeded to do it again elsewhere (and whether it succeeded or failed, made the lives of those involved miserable to some degree or another), but that it used these Janissaries to spread its virus far and wide - and calling them Serbs all along, thus adding insult to injury.